The entire idea of a blockchain is to record each and every transaction. That’s pretty much the only solution a blockchain solves, and that’s straight from the mouth of the National Institute of Standards and Technology. Because of this, we can trace Bitcoin back to the very beginning. Here it is, Block #0, or Block #1, there was an off-by-one error in the early days, ‘doncha know. Apart from being the foundation upon which the entire Bitcoin blockchain is built, there is a bit more data in the Genesis Block. The text, “The Times 03/Jan/2009 Chancellor on brink of second bailout for banks” is embedded in the raw block data. There are different interpretations on why this data exists. It could be that Satoshi simply picked up a copy of The London Times and wrote down the headline, just like you would hold up a picture of a newspaper to timestamp a photograph. It could be a comment on a fractional reserve banking system. In any event, if you ever find a copy of The Times from January 3, 2009, you’ve just found half a million dollars. That’s what Bitcoin collectors are asking for a copy of this newspaper. 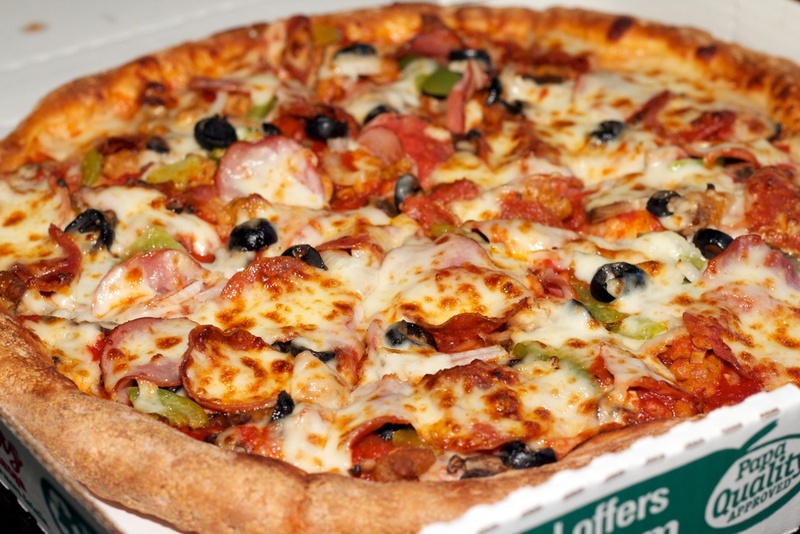 At one point, this Papa John’s pizza was worth $750,000. Image credit Laszlo. It’s a tautology, but Bitcoin is only worth something if it’s worth something. A medium of exchange, if it were. In the early days of Bitcoin, back in early 2010, the community surrounding Bitcoin was a lot like Dogecoin community of 2014. Your Bitcoin program just generated these ‘coins’. No, you couldn’t spend them anywhere. People were collecting Bitcoins, because it was something to do. It was novel. People were giving away Bitcoins for free, just to watch them move around the blockchain. Then, in May of 2010, something changed. Over on the bitcointalk forums, Laszlo came upon an agreement with another member. Laszlo would give 10,000 BTC to another forum member for two Papa Johns pizzas. The pizzas were reportedly a large ‘works’ and a large ‘garden fresh’, and cost the buyer between $30 and $40 USD. Before, people were giving each other Bitcoins for a few cents each, but Laszlo’s pizzas are the first time Bitcoin could be assigned a value in a real currency. In this exchange, one Bitcoin was equal to 0.3 cents. At the heights of the Bitcoin bubble, these pizzas would be worth $1.5 Million USD. Laszlo is famous in the Bitcoin community, and not just because he spent a million dollars on two pizzas. He was one of the first to release a GPU miner, simply as a fun project while learning OpenCL. He mined all his coins on an nVidia 9800 GTX+ / hackintosh rig, later moving on to a 2x Radeon 5970 rig. Your GPU miners, especially the ones running on OS X (however rare that may be) can trace their origin back to the guy who bought a million dollar pizza. The guy that sent him the pizzas? He bought a house with his pizza bitcoins. Buy Drugs With Magic Internet Money! While supporters of Bitcoin say it’s an experiment in economics, the solution to the Byzantine General’s problem, an innovative new technology; this isn’t what the majority of people thought in 2011. The first popular use of Bitcoin, outside weird forums based out of Neckbeardistan, was as a way to buy drugs. Supporters of Bitcoin will say it was an interesting technology built by some very smart people, and maybe a few entrepreneurs got into the game before cashing out in Puerto Rico. This is a false narrative. The cultural zeitgeist of 2011 and 2012 is that Bitcoin was a way to buy drugs on the Internet. Bitcoin was how you bought drugs on the Internet, full stop. You could buy drugs with Bitcoin on The Silk Road. This was the purpose of Bitcoin (aside from buying pizzas). The Silk Road was an online market operating on the Tor network. The easiest way for anyone to access the Silk Road was to download a Tor browser, copy and paste the Silk Road address, and look at the amazing variety of products available on the Silk Road. You could buy weed, fentanyl someone stole from their grandmother, zanzibars, heroin — actual heroin, with a picture of a beautiful red and black flower — and whatever else your dopamine receptors desired. Chloroform? Sure thing, buddy, but it doesn’t work like you think it does. Cocaine? Okay. Crack? No problem. You should actually buy cocoa paste, though, because that’s the most efficient way to ship it. How do you pay for these things? Magic Internet Money™! This paragraph is a completely accurate representation of what the public thought Bitcoin was for in 2012. The Silk Road was started by Dread Pirate Roberts, a pseudonym for Ross Ulbricht to “give people a first-hand experience of what it would be like to live in a world without the systemic use of force.” This is the central tenet of crypto-anarchism. If you’d like to know what crypto-anarchism is, this is the dictionary definition — it is using cryptography to live in a world without a government and its exclusive right on the use of force. Unfortunately for Ulbricht, we do live in a world where the government has the exclusive right to the use of force. He’s currently serving life, plus forty years, without the possibility of parole for money laundering, computer hacking, and conspiracy to traffic narcotics. It is incorrect to say Ulbricht is in jail because he solicited a murder-for-hire; these were not included in his indictment, and the lead prosecutor said none of the murder-for-hire allegations occurred. The Bitcoin Bubble wasn’t all about buying drugs over the Internet. A few people made it big, some bought yachts, and others did something productive. The biggest headliner went by the name of Pine, and The Pineapple Fund did good. The Pineapple Fund started with an individual that claimed to be among the 250 largest holders of Bitcoin in the world. The fund gave away 5104 BTC, turning that into $55 Million for charities ranging from the EFF ($1 Million), the Internet Archive ($2 Million), The Water Project, a project to bring clean water to Sub-Saharan Africa ($1 Million), the ACLU ($2 Million) and the OpenBSD foundation ($50,000). The disbursement of Bitcoin was, “timed with the 2017 crypto bubble”, which was absolutely the best time to get rid of Bitcoin. If you ever get a time machine, go to 2010, trade some pizzas for Bitcoin, then go to December 2017 and give your Bitcoin to worthy causes. That’s the most good you’ll ever be able to do. While not directly related to Bitcoin, Dogecoin started off as a cryptocurrency that was as fun as million-dollar pizzas. The only difference? The fun never stopped. Dogecoin was founded almost exactly five years ago by Billy Markus and Jackson Palmer at the height of the crypto craze. It’s a joke coin, yes, but it’s also a such coin. Wow. Just months after the creation of Dogecoin, these coins were being given away on reddit and other forums. Dogecoin was, like the early days of Bitcoin, almost a joke but not quite. The coins were being traded on markets, but the value was so small an individual coin was of basically no value. Dogecoin was the equivalent of likes on Twitter; it didn’t mean anything, no one was going to get rich off of it, but giving someone a few hundred Dogecoin was appreciated. Then the jokes continued. The Dogecoin community decided to send the Jamaican bobsled team to the Olympics. Yes, Cool Runnings, the 1993 movie starring John Candy, was made real once again. This was done as a joke. A joke cryptocurrency made a relatively obscure movie (that could have used more ninjas) popular again and sent a team to the Olympics. Later, the Dogecoin community sponsored a NASCAR. Although Dogecoin isn’t getting a lot of press anymore, neither are any other cryptocurrencies. That’s a shame, because Dogecoin, by redesign, has an unlimited supply. There will only ever be 21 Million Bitcoin, but there will be an infinite number of Dogecoin. No one knows what will happen when the last Bitcoin is mined, or what will happen to any deflationary coin years down the road. Dogecoin, on the other hand, is an inflationary coin, and by far the most popular inflationary coin. The history of Bitcoin and other cryptocurrencies mirrors the history of money. We’ve gone from people collecting bits of gold they found in a stream or bits they willed into existence on their CPU. Great mines were built to dig gold out of the ground, leaving a mercury-soaked Superfund site for future generations to clean up, and GPU mines belched CO₂ into the atmosphere. Conmen capitalized on tulips and ICO startups. Finally, the whole system collapsed. The entire history of economics and money has been condensed into a single decade, all thanks to Bitcoin, and years from now a Nobel-winning economist will accept the reward, knowing that they got their start with Magic Internet Money in 2012. While ( the most?) popular, I don’t think it was “first popular”. Really? I was under the impression the ransomware thing was a relatively recent development. It sounds like Ulbricht didn’t fully think his analogy through. Neither the original Dread Pirate Roberts nor his successors were against the systematic use of force; they just preferred applying systematic use of force to acquire treasure or break into rival love interests’ castles. > The disbursement of Bitcoin was, “timed with the 2017 crypto bubble”, which was absolutely the best time to get rid of Bitcoin. If you ever get a time machine, go to 2010, trade some pizzas for Bitcoin, then go to December 2017 and give your Bitcoin to worthy causes. That’s the most good you’ll ever be able to do. NVIDIA misses earnings. Bitcoin peaked in December 2018. Coincidence? Do you mean 2 months ago ? Because I think you actually may have meant December 2017. I fully agree with you and I’m wondering where the 1.5 million dollars came from. 10,000 BTC could be exchanged today for $34,019,100 and at the peak so far (2017-12-15) could have been exchanged for $196,500,100. Yeah but given that you can already subdivide a bitcoin into 10000(?) parts what does a cap of 21 million really mean. What limit is there on the number of decimal places in a real number! Bitcoin uses 8 fixed decimal places. So 0.00000001 bitcoin is the smallest possible denomination; this is called a Satoshi. When the maximum number is fixed, no matter how small you can divide it, it doesn’t divide the number of coins already in someone’s wallet. That creates the Uncle Scrooge effect: the more bitcoins you put away and don’t use, the more they will be worth because everybody else has to divide and divide their coins to match the amount of goods being traded. Deflation – everybody tries to get the coin, nobody wants to spend it, and the moment anyone tries to cash their coins there’s a sudden influx of money and instant inflation happens – everyone’s coins lose value and a spending spree ensues. Boom and bust. That’s the problem of deflationary currencies. They’re hoarded, and when the amount of money hoarded is much larger than the amount of money actually in use, the whole market becomes unstable and unworkable. The price fluctuations mean people can’t buy or sell, they can only speculate about the price of the money. That’s why it’s good to have things to buy with currency. For now without the hype only those (amateurs & professionals) interested in developing the technology for real world applications will continue to do so. It will be interesting to see what they create over the coming decade. Thank you for this pleasant recall of history. It however misses a word on currency exchange platforms. The main weakness of the Bitcoin system lies at its border, i.e. how crypto-tokens can be exchanged for other goods. I think loss caused to many coin holders by the Mt Gox bankruptcy (should I say massive fraud?) is a good illustration. Using pizzas to assign an initial value, why pizza why, because tulip bulbs aren’t a rage these days?